Groups are a vital component of our network. Groups are where we may discover and connect with other activists who share our interests and/or our geographic region. Groups are where “conversations” take place, and where events are posted and publicized. Create a new group or sub group. Create an event, either for the group or the entire membership. Add a resource, either an uploaded document or a link to an external source. Create a sub-group. For example, if you are interested in carbon taxes but want a subgroup for people in your state you could create a subgroup under carbon taxes for people in your state. To check out the existing groups, or create a new one, first select Groups from the main site menu on the left. This opens the Groups Dashboard. Groups are listed in two sections. Groups to which you belong appear on the top, and a selection of “featured” UU groups appear below. 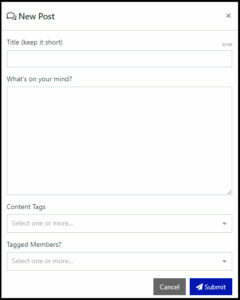 Menu links to create a new group, or search existing groups, are located on the top right of the Groups Dashboard page. To join a group, first open its page and then look for the orange Request Membership button on the upper right. If you later choose to leave a group, the Leave Group button is in the same place, on the upper right. 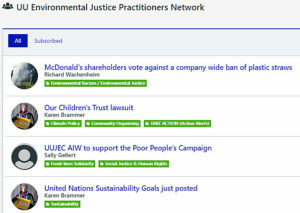 Each group has six internal pages (About, Conversations, Members, Events, Resources and Sub Groups) accessed by clicking the blue menu tabs at the upper right of the group’s page. Group moderators will see a seventh tab, Admin. This page includes key information about the group, tells you who the moderators are and allows you to email the group moderators by clicking the Email Moderators button, at the bottom of the page. Conversations are a series of interactive comments/posts between group members on specific topics. Any group member can create a new conversation or join an existing one. When you open this page, you will see the existing group discussions. To view a conversation, simply click its blue title on the list. This will open a new page containing that conversation’s posts. To add your own post, click the orange Comment button on the top right. As with other comments, you can tag specific group members in this first post. Type their name into the Tagged Members? field and select the name of the person you would like to tag. This will send that person a notification about your new post. Events must be created within a group page. Once created, they may either be shared with the entire membership or else remain visible only to group members. Click the red + Create Event button, and a form will pop up. Fields include: event title, description, content tags (select one or more relevant issue tags,) start and end times, and a physical or virtual address for the event. If you select Public, a field will appear asking if you want to Post to News Feed. This will post your new event on the News feed of our website Dashboard, and also cause it to appear on the Featured Events list of all members when they open the site’s main Events menu tab. Any group member may add a resource to the site. Cick the Resources tab at the top of the group page. Sub groups are visible only to members of their parent group. To view them, click the blue Sub Groups tab at the top of a group page. This will open a list of all (if any) existing subgroups. Click on the name of a subgroup to inspect its details. To join a subgroup, click the orange Request Membership button on the upper right. A group moderator will respond to your request. To create a new sub group, click the orange Create Sub Group button on the upper left. If you are not a group moderator, then the sub group will not be created until a moderator approves it. Required fields include purpose/description, group type and content tags. Optional info includes links to a website, Twitter account or Facebook page.